It’s amazing how much discussion there is about personal finance…a thread about finance on Reddit’s Slate Star Codex thread got over 80 replies. In parts 1 & 2, I make an argument for owning real estate over stocks. I assume that someone, hypothetically, has a sum of money saved up (such as $40,000) or as a gift or inheritance, and is deciding whether to rent and invest the $40k in stocks–or–put the $40k on a down payment. I updated Part 2 to include simulations of how, over the long-run, real estate and no stocks is better than a combination of stocks and renting. This is correlated with the size, initial condition, and age of the home. Small new homes tend to have less maintenance than big old homes. Maintenance costs are more of an issue if you rent the property out instead of using it as a main residence. In my simulations, I assume the property is a main residence. In my simulations, I assume a 30-yr fixed-rate mortgage. The fixed rate is a hedge against higher inflation, although 30-year fixed-rate mortgages may not be available in all countries, such as Canada. 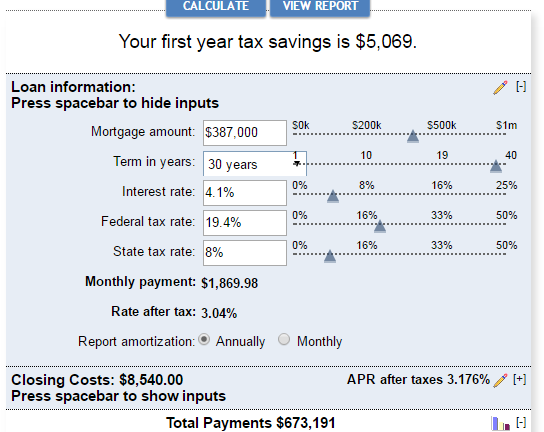 Property taxes are offset by mortgage interest deduction, which is an adequate approximation. Long-term capital gains for the sale of real estate is 20%. A roth IRA has the advantage of being untaxed. You aren’t risk-adjusting your estimate. What if the city turns into Detroit? What if your home gets hit by an uninsured disaster? What if you get toxic mould in the brickwork and have to replace the walls? Real-estate might provide better average returns but for most people it’s going to be a huge percentage of their capital. That means there’s a huge downside – they could lose everything if disaster strikes on that one investment. That’s something the stock market protects against. It allows diversification to mitigate those kinds of scenarios. You are also making a false comparison – you’re comparing the whole property market to the stock market, when you should be comparing average volatility per property. If I own a single house, the volatility on its price is going to be way higher than the general market and there are a lot more lose-everything scenarios. Stocks also have risks: fraud, bankruptcy, loss of market share, recession, disaster, crisis, etc. Because a home has tangible value, it can’t go to zero, unlike individual stocks. The worst I have seen is a home fall 50%, which was in certain areas in 2008-2011 (but the typical decline was more like 25-30%), but individual stocks fall 50-90% very often, and sometimes never recover. The S&P 500 lost 50% of its value in 2000-2003 and again in 2007-2009. It lost 20% of its value in 2011 and 15% in early 2016, although it quickly recovered in both instances. But, yes, the leverage of real estate can magnify losses, but being able to pay the mortgage is what matters. Often, many will ‘walk away’ (strategic default) if the home becomes too far underwater, although this will hurt credit score. When stocks go underwater, however, there are far fewer options than when homes go underwater. The use of long-duration mortgages and small down-payments lessens risk, because less initial capital is at risk. Home insurance is much cheaper than ‘stock insurance’ (put options). Obviously, it takes longer to sell a home than to sell a stock, but some real estate markets can close pretty quickly. In the Bay Area, for example, there is often a long list of waiting buyers. Sales can be competed in weeks. As shown in #5, although the S&P 500 is diversified it can still sustain large losses during bear markets and recessions. My simulations assume excess wages are invested in the S&P 500, boosting diversity.